Walid Bey Jumblatt (Arabic: وليد بيك جنبلاط‎‎; born 7 August 1949) is a Lebanese politician and the current leader of the mostly Druze Progressive Socialist Party (PSP). He was born in August 1949 to the Jumblatt family as the son of PSP's founder Kamal Jumblatt. He is the maternal grandson of Prince Shakib Arslan. Walid Jumblatt graduated from the American University of Beirut with a bachelor's degree in political science and public administration in 1982. Upon graduation, Jumblatt worked as a reporter for An Nahar in Beirut. The BBC describes Jumblatt as "leader of Lebanon's most powerful Druze clan and heir to a leftist political dynasty based around the Progressive Socialist Party". Assem Qanso of the Arab Socialist Ba'ath Party of Lebanon accused Jumblatt of abandoning his father's beliefs. In July 1983, after Amine Gemayel became president, Suleiman Frangieh, Rashid Karami and Walid Jumblatt formed a Syrian-backed National Salvation Front to challenge Gemayel's rule and the pact between Lebanon and Israel that was financially supported by the US. Jumblatt served as minister of public works, transport and tourism in the National Unity cabinet led by then prime minister Rashid Karami, which was formed in May 1984. His main ally during the war was Amal Movement's leader, Nabih Berri. He was a supporter of Syria, but following the death of Syrian President Hafez Assad in 2000, he campaigned for Damascus to relinquish control. Jumblatt's close links with the Syrian old guard alienated after the presidency of Bashar al-Assad. This pitted him against then president Émile Lahoud and the Lebanese Shiite party Hezbollah of which he said: "Their fighters have done a good job defying and defeating the Israeli army, OK, but the question we ask is where their allegiance goes: to a Lebanese strong central authority or somewhere else?" 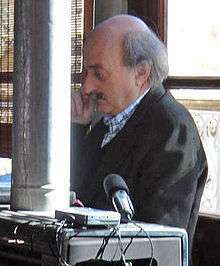 In the 2009 general elections, Jumblatt won a seat from Shouf as part of the 14 March Alliance list. With the onset of the Syrian Civil War, Jumblatt and the PSP moved towards an anti-Assad stance. Jumblatt has been crucial in negotiations regarding the Syrian Druze during the Syrian Civil War, and has stated about al-Nusra Front “I cannot classify, like Western countries, Nusra as terrorist because most of Nusra are Syrians. The terrorist regime of Bashar obliged the Syrians to join Nusra”. After al-Nusra Front allegedly killed 20 Druze villagers in Qalb Loze on 10 June 2015, Jumblatt responded that "Any inciting rhetoric will not be beneficial, and you should remember that Bashar Assad’s policies pushed Syria into this chaos". Jumblatt was twenty when he married his first wife, who was an Iranian actress and older than him. His father did not endorse the marriage. His second spouse was Julia Ammar "Juju," a Druze woman of Yanta Lebanon origin, who is the mother of his child Taymour (born 1982). Like many political leaders, Walid Jumblatt has been the subject of photography since the late 1970s. The photographer Ziad Antar made a portrait of him using an old expired film, which produced a ghosty effect. The image supposedly evokes the danger the Lebanese Druze leader faces after he had criticized Hezbollah and the Syrian government. Jumblatt is also known for his bold sense of humor. In October 2014, he joined Twitter, attracting a large number of followers with his unconventional tweets. On April 1, 2015, he celebrated April fool's day by announcing that forces loyal to his party were shelling the U.S.-Iran nuclear talks in Lausanne with weapons of mass destruction made of hashish and fruits. ↑ "Walid Jumblatt's exit could weaken U.S.-backed coalition". Los Angeles Times. 3 August 2009. Retrieved 13 August 2011. ↑ Dominique Avon; Anaïs-Trissa Khatchadourian; Jane Marie Todd (10 September 2012). Hezbollah: A History of the "Party of God". Harvard University Press. p. 204. ISBN 978-0-674-06752-3. Retrieved 14 April 2013. ↑ "Kamal Jumblatt". NNDB. Retrieved 13 August 2011. ↑ "Lebanon's new miracle" (in French). 1st Jordan. Retrieved 13 August 2011. 1 2 3 4 5 Glass, Charles (1 March 2007). "The lord of no man's land: A guided tour through Lebanon's ceaseless war". Harper's Magazine. Retrieved 9 April 2013. ↑ "Who's who in Lebanon". BBC News. 14 March 2005. Retrieved 13 August 2011. ↑ "Qanso: Jumblatt abandoned his father's principles". NOW Lebanon. 6 February 2012. Retrieved 16 February 2012. ↑ "Anti-Gemayel 'front' formed in Lebanon". The Milwaukee Journal. 23 July 1983. Retrieved 23 March 2013. ↑ Owen, Roger (October 1984). "The Lebanese Crisis: Fragmentation or Reconciliation?". Third World Quarterly. 6 (4): 934–949. doi:10.1080/01436598408419807. JSTOR 3991803. 1 2 Gambill, Gary C.; Elie Abou Aoun (August 2000). "Special Report: How Syria Orchestrates Lebanon's Elections". Middle East Intelligence Bulletin. 2 (7). Retrieved 17 March 2013. ↑ Chicago Tibune interview 11 August 2006. ↑ "New parliament composition" (PDF). 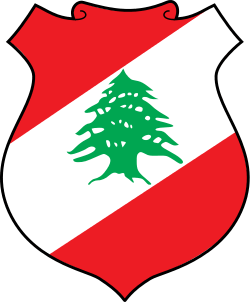 Lebanese Information Center. Retrieved 21 January 2013. ↑ "PSP to Rally in Support of Syrian People, Expulsion of Syrian Ambassador". Retrieved 3 September 2012. ↑ "PSP Demo Urges Syria Envoy Expulsion, Arrest of Syrians in Samaha Case". Retrieved 3 September 2012. ↑ Teofimov, Yaroslav (11 June 2015). "To U.S. Allies, Al Qaeda Affiliate in Syria Becomes the Lesser Evil". The Wall Street Journal. Retrieved 11 June 2015. “I cannot classify, like Western countries, Nusra as terrorist because most of Nusra are Syrians. The terrorist regime of Bashar obliged the Syrians to join Nusra,” said Walid Jumblatt, a prominent Lebanese politician and a leader of the Druse community who has been negotiating with Nusra over the security of Druse villagers in Idlib. ↑ "Political poster of Walid Jumblatt, leader of the Druze community and Pt of the Socialist Progressive Party". Magnum Photos. Retrieved 23 March 2012. ↑ Andrew Pulver (9 March 2011). "Photographer Ziad Antar's best shot". The Guardian. Retrieved 23 March 2012.